Salvation And Survival: How Do We Love Our Enemies? Today I need to get a little personal ... in the sense that I need to discuss an issue that I know is troubling many of my fellow Christians. I know this because I have received a heartfelt email from a reader whom I know is sincere in her faith. And I know that I need to try to write about this because it is something each of us needs to come to terms with in our own spirits and hearts -- and that includes me! I believe I can write about this without betraying her confidence because it was an email that millions of Christians across America could have written. In short, this reader wrote to ask me for suggestions on how she can walk out her faith and learn to love the unsaved Muslims in our country. Now, I want each of you to be honest ... haven't you at one time or another struggled with what you know are unChrist-like emotions? We wouldn't be human if we didn't battle feelings of anger towards the radical Muslims who are filled with so much hate for our nation and way of life that their goal is to take innocent lives in some perverted sense of obedience to what we know is a false god and evil ideology. And I believe we would be unwise if we didn't acknowledge the Islamic doctrine of Taqiyya (taqiya, taqiyah, taqiyyah), which is a form of Islamic deception. The Quran (16:106 and 3:28) allows Muslims to lie in order to protect themselves or to protect the Muslim community. And I think we would be foolish to not feel disappointment in our government's lackluster efforts to defend us, and their denial that there is anything to worry about. Furthermore, I suspect that many of us are confused over how -- as law-abiding citizens concerned about our rights -- we have become a threat (in our own country) to the liberty of refugees and foreigners! Finally, if you are like me, you are perhaps worried over how easily our youth are tempted to adopt the false religions of the world. My husband and I encountered a young employee at Home Depot, and as he often does, my husband asked the young man about his tattoos (he is always interested to know why they have chosen the symbols they have). This young man had a tattoo which he said "symbolizes the moon god because that culture interests me". All I could think was, "Father, forgive him for he knows not what he does". So all that addresses our human emotions and thoughts. But what about our spiritual struggle with these issues? If we are to be honest and faithful Christians, then we know that we are to "love our enemies and pray for those who persecute us". Jesus made that very clear in Matthew 5:44. I will be the first one to admit that this seems like an impossible commandment ... and one that our ultimate Enemy, satan, will use against us in order to convict us of a powerless and faithless life. Loving an enemy that hates my faith and wants to kill and destroy me and my family is a difficult thing to do, but anything less does not follow in the footsteps of Jesus. Remember that He willingly laid down his life and asked His Father to forgive those who killed Him. And He did not hate them. I can hear the disagreements now ... Jesus would not want us to bow to political correctness, or not defend our families or faith. The Bible tells us that we "must hold firm to the trustworthy Word as taught, so that we may be able to give instruction in sound doctrine and also to rebuke those who contradict it." But loving our enemies? What does that look like in the wake of events like Orlando? Perhaps we can start by determining what it does not look like. Yes, Jesus tells us to love them unconditionally -- no matter what they do to us -- but it doesn't mean that we agree with what they do, or make excuses for it. My reader commented on how difficult it was becoming to see Muslims begin to dominate in our culture, and to see unvetted refugees streaming into the country in the wake of atrocities that have been committed in their home nations. She knows it is God's desire that none should perish, but in the face of what appears to be unreconcilable differences, and blatant and obvious hatred towards us, she is finding it difficult to imitate Christ. I'm afraid that I have no quick fix or easy solution. For myself, I have decided to try to discern what God has told us throughout the Bible when it comes to living among people who are enemies. God never changes, and what He commanded His people to do in the Old and New Testaments, remains the standard by which we should live our lives. First of all, as I told the reader, God did not ask His people to accommodate new religions or politically correct viewpoints. In fact, He commanded them to resist compromising with corrupt nations; to never adopt false religions or gods; and to keep His statues forever. Of course, one of those statues is to pray for, and to love our enemies. As evidenced by the growing number of jihadist murders in our country, the enemy is no longer at the gate, but firmly embedded within our culture, with more likely inserted among the thousands of refugees admitted to our shores. So how do we live our faith and be imitators of Jesus? I can tell you that I can't do it through my human will. I have to pray in my spirit, bowing down before the throne of God in heaven, and asking Him to protect our nation from this enemy -- that the scales be removed from their eyes, and that they meet Jesus. That is what I do in the spiritual realm. In this physical realm, we do everything we can to stop the invasion against our laws and our culture. And when given the opportunity, you meet their hate with the love of Jesus. Like Jesus, we do not return their hate with malice. Jesus held no grudges; He never added insult or injury to those who injured Him; He was kind in the face of vitriol, criticism and anger; He was forgiving of those who hated Him; and He never counseled revenge. I know that this attitude and these reactions seem contrary to everything our minds and emotions tell us. 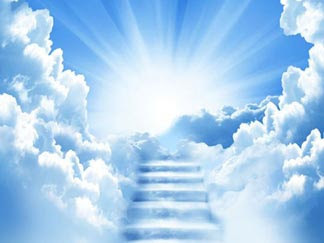 But remember, we are not to act according to our flesh, but in agreement with our spirit, which is seated in the heavenly realm with Christ. Hence, through our gift of salvation, we are to show the unsaved what it is like to be in relationship with Jesus Christ ... as difficult as that might be in the face of murderous hatred. And each time we show love to our enemies, it is one more strike of the Sword of the Spirit in the spiritual realm. I am in no way intending for this to sound as if it is simple and everyone should be able to do it easily. We are no longer viewing a long-distance enemy, but one who is literally in our backyard. But we need to see this as the spiritual battle it is. Fighting the enemy with human effort will never completely banish him. The physical battle we see today is an extension of centuries of the same physical war. In order to defeat the enemy, we must do it spiritually, and with Divine help. Jesus never asks us to do something He did not do as a man, Himself. As simple as it appears, He gave us a good example of how to follow Him. It is expressed in Luke 6:27: Do good to those who hate you. Doing good to those who hate us displays [to them] the love of God. And maybe, maybe, if we show them the love of God, they will experience something they have never experienced before, and will want more of it. That is what I am hearing from a young friend who is part of a missionary team of college-aged Americans who are on a summer trip to the heart of Europe and the refugee camps to share the good news of Jesus Christ and His love. She has shared such amazing testimonies among the people she has met; people from Germany, Romania, Italy, Morocco, Turkey, Syria, India, UK, France, Algeria, Bulgaria, Kenya, Nigeria, Pakistan, Cameroon, Rwanda, New Zealand, Netherlands, Russia, Spain, Indonesia, Tunisia, Afghanistan, and the Congo. She believes that God is touching the lives of Muslim refugees, the rest of Europe, and in turn the rest of the world. Keep in mind that Europe has suffered horrific jihadist attacks in the last year. Yet she tells of one of her teammates who was sharing the gospel with a Muslim refugee, and the man kept saying "don't stop, please keep going, I need to hear this." And there are many more stories like this one among the Muslim populations of the world. And to quote a sermon I read on the website, Redeeming God, "[In order to stop] the cycle of hate and the cycle of revenge, the cycle of retaliation [must] stop with us. You can be angry at a person for what they do, and yet still love them. Jesus was upset at the people of Jerusalem for how they abused and murdered the prophets, and yet He still shed loving tears over the city. Jesus, as always, is our best example for how to live out such principles." If you still find yourself unable to do this, and the devil has gripped your heart in a vise of bitterness, hostile thoughts, and hateful emotions, then speak into the spiritual realm and declare the Word of God. Find all the verses in Scripture where Jesus tells us that love conquers hate and proclaim to spirits [who actually hear you] that you belong to Him and you will not give in to satan's temptation to hate. There will be those who will be unable to go beyond their human capabilities. And working in the spiritual realm with the Holy Spirit is a learned skill. But you have to try in order to be able to do it; and you have to do it to become confident in your power and authority [in Jesus and the Holy Spirit] in order to conquer the spirit of hate that comes from the Evil One. As I've said repeatedly ... it's not easy. That is evident by the history of war through the ages. But it should also be evident that humans cannot replace hate with love by their own volition. We must appeal to Jesus and fight this battle in the spiritual realm as well as the physical. After all, that is exactly how Jesus did it! Luke 6:27-28 "But I say to you who hear [Me and pay attention to My words]: Love [that is, unselfishly seek the best or higher good for] your enemies, [make it a practice to] do good to those who hate you, bless and show kindness to those who curse you, pray for those who mistreat you." Thank you for this! I've actually printed it out so I can study it & remember what I need to do the next time I'm in this situation. You're exactly right that we just cannot show the love of Jesus to our enemies using only our human effort. It's just too tough to overcome the feelings of fear, resentment and hatred. I thank God for the work you do which helps me grow in my Christian faith. I hope you know what a blessing you are! I am simply a mirror to the human thoughts and emotions of all true Christians. I am flawed just like the next person, and am just trying to be obedient to my Lord and Savior, the Master of my Soul and Spirit, by listening to what He wants us to talk about during these turbulent times. I am attacked with spirits of doubt, unbelief and fear just as many are, but I cling to the knowledge that Jesus, in me, is more powerful than anything in this world. Together, with Him, I don't have to live in defeat and I call upon Him day by day, hour by hour, and sometimes minute by minute to help me live a joyous life. I can't do it without Him! Something to consider. The word translated as enemy is better translated as odious in the Greek. Looking at the word as odious means looking st someone as revolting, repulsive from our perspective. Two great examples of this are the women at the well and the good Samaritan. In both stories the ones considered repulsive from the Jewish perspective at that time are treated with kindness. The parable of the good Samaritan makes the reviled one the hero and shames the Jews. As to the woman at the well,she is shocked that a Jew would acknowledge her and especially that HE would take water from her hand! That is why the disciples were amazed also. I believe the word translated as enemy gives the wrong impression. Yes, the word enemy in Mark 5 is translated as "odious", but also as "hostile" and "an adversary". According to Strong's Concordance, it specifically points to being opposed to God, of being unregenerate in an attitude towards God. I do not refute your analysis of the woman at the well and the good Samaritan as being people that were despised by the Jews, and to whom Jesus showed His love, thus amazing the disciples. 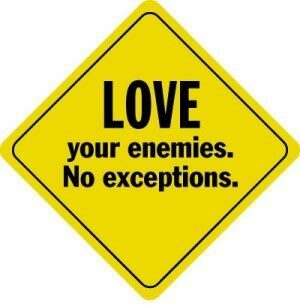 But I find good evidence that "enemy" means those who hate us and despise us and our God. Either way, we are to show the love of Jesus to everyone.